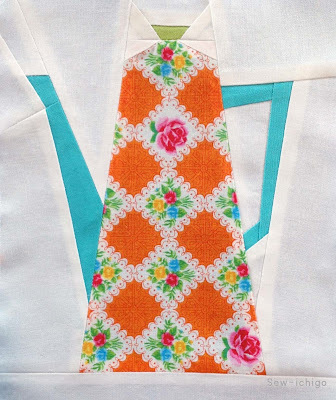 Doing a little housekeeping today and because of the demise of google reader, we've claimed our sew-ichigo on bloglovin'. You can find the link over there on the right sidebar. It looks like this! And if you haven't used bloglovin' much, you're in for a sweet surprise! It's super easy to use, clean, and I love reading the blogs I follow with it for those reasons! Yay! Penny and I are over the moon to present our newest pattern set, Parisienne Cafe. 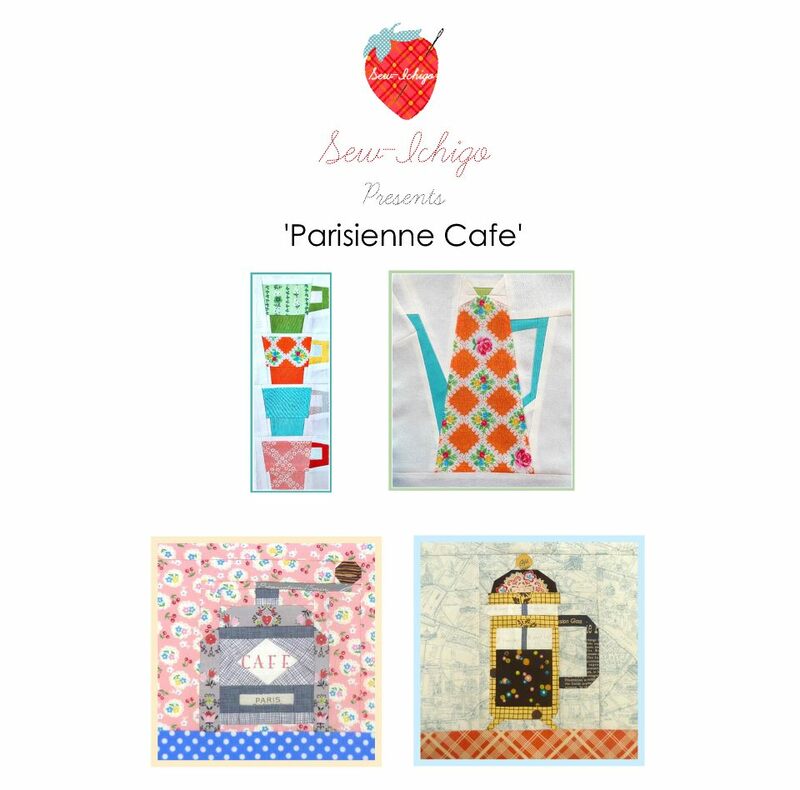 It's in the Sew-Ichigo shop now and being added to our Craftsy shop too. For those of you who have bought our patterns before you will notice a change. The patterns are present as a single unit for you to cut up into sections. The cutting lines are marked with a thick blue line and a scissors icon. This gives you additional flexibility if you want to size the block up and down and it makes the pattern more accurate. It also means that there will be no paper in the seams which I found a lot easier when sewing the blocks together. The patterns are for foundation piecing but can also be traced or printed on to freezer paper if you prefer to piece that wasy. Are you ready for some close ups? Starting with 'Espresso Cups' The easiest pattern in the set. Make one, make 4, whatever you like! It's such a fast pattern you can easily make multiples and use different prints and colours. Followed by 'Coffee Grinder', this is an advanced beginner- lots of straight seams but some small pieces. 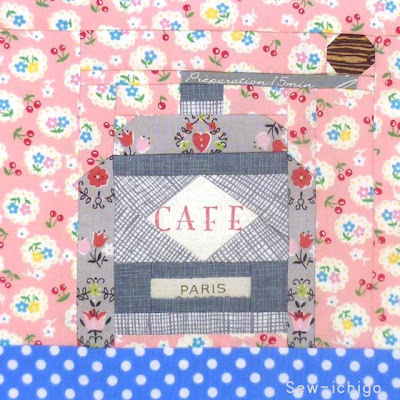 The 'Cafe' label was made stamping a piece of fabric before adding it to the block. It is the first piece in that section which makes it easier to place precisely- I used a little dab Sewline fabric glue stick to get it exactly where I wanted it. We have a stamping tutorial here. The 'Tea pot' pattern is another advanced beginner pattern and such an elegant shape! The main fabric is again the first piece of fabric you will add so you can centre motifs and fussy cut patterns to make the most of the slender shape. And finally, the 'French Press/Cafetiere'. This is an intermediate pattern, mainly because of the size of the pieces. The hardest bit is the feet- but then I always find diagonals need a bit of extra attention! 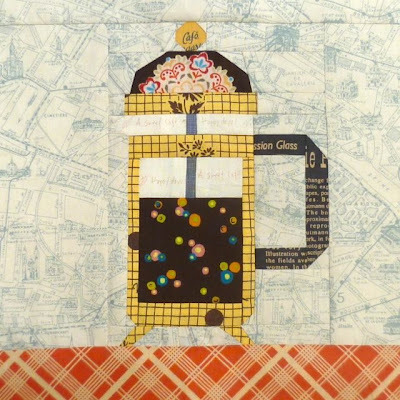 The block is sized at 5 1/4" x 7 3/4" and then strips are added at the sides and top for background and at the base for the 'table' it is sitting on. This makes it easy to make the sizing match common quilt block sizing- 10" square, 12 1/2" square and so on. We hope you enjoy our new designs, available as a pack in our shop right now! Look out on our blogs for a chance to win a pattern set too!